In June I wrote an article regarding changes the Government was thinking about making to post-study work rights for students and visa entitlements for their families. The Government’s intention with these changes is to remove employer-assisted work visas which have been used by unscrupulous employers to exploit immigrants and to encourage international students to select high-quality courses that will deliver good employment and residency outcomes. therefore, domestic student visa entitlements for school-age children of Masters level 9 students. As originally proposed, the changes announced offer degree graduates a 3-year open work visa. The flexibility of a 3-year open work visa will give graduates the time they need to build some New Zealand work-experience and secure a senior position that meets the skill and income requirements for residency as a Skilled Migrant. The changes announced have different impacts depending on the level on the New Zealand Qualifications Framework (NZQF) of the qualification being studied. Existing students studying a level 4 – 7 non-degree programme that would currently meet the requirements for an employer assisted post-study work visa on graduation will also get the benefit of a 3-year open work visa. Only students who apply for visas for courses at these levels in the future will be worse off because they will lose the opportunity to apply for a 2-year employer assisted visa. These changes make New Zealand’s post-study work rights much more competitive with countries like Australia 2 (Bachelor Degree and taught Masters – 2 years, research Masters – 3 years, PhD – 4 years) and Canada 3 – from 8 months to a maximum of 3 years. 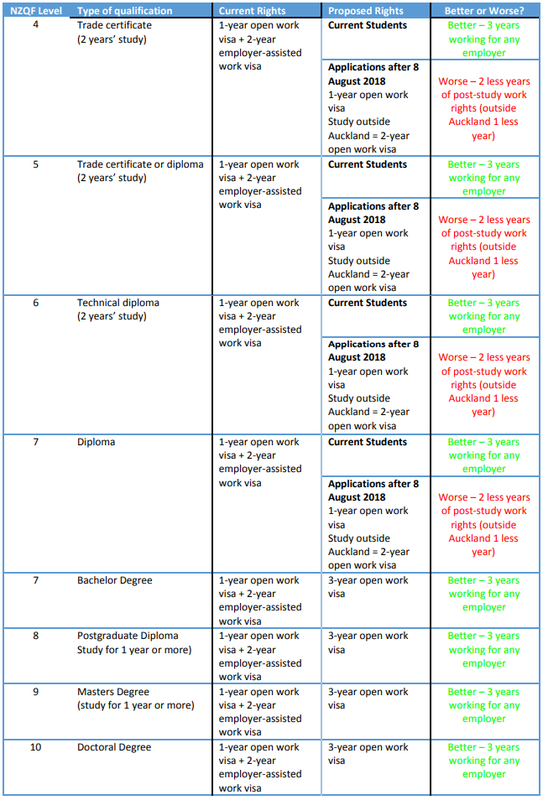 – If the visa they hold or apply for is a one-year open work, then they will be entitled to apply for a further 2-year open work visa when their current visa expires; or – If the visa they hold is employer-assisted, they will be entitled to apply on 26 November 2018 for a Variation of Conditions to have the job and employer stated on their visa removed (i.e. it will become an open work visa). At the moment, partners and children of level 7 students studying a qualification relevant to an occupation on the Long-Term Skills Shortage List, postgraduate Level 8 or 9 students or PhD level 10 students are entitled to pass on work visa entitlements to their partners and, therefore, domestic student visa rights to their school-age children. From 26 November 2018, Level 8 postgraduate students will lose this entitlement. All other students described above will continue to have the right to pass on work visa entitlements to their partners and, therefore, domestic student visa rights to their school-age children. 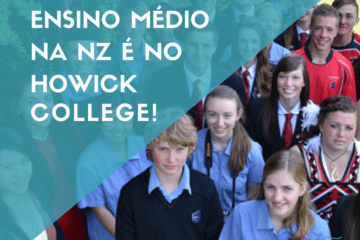 New Zealand has just become a much more attractive study destination for Bachelor, Masters and doctoral level students. The flexibility of the 3-year open post-study work visa will give graduates more time to secure employment at the right skill level and rate of pay for their residency application. 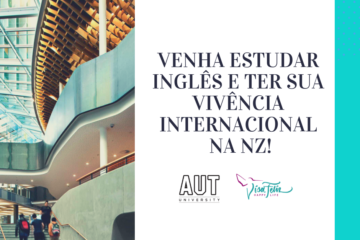 Zealand based Brazilian agency representing University of Auckland, AUT University, Massey University, Lincoln University, Victoria University of Wellington and University of Otago. Em junho, eu escrevi um artigo (leia aqui) sobre as mudanças que o governo estava pensando em fazer sobre direitos trabalhistas para estudantes e direitos a vistos para suas famílias depois do término do curso (post-study work visa). 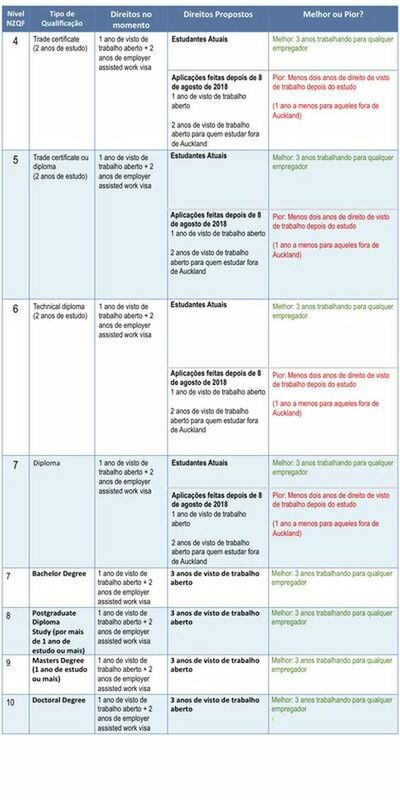 A intenção do governo com essas mudanças é excluir vistos de trabalho dados por empresas que tenham sido usados por empregadores inescrupulosos para explorar imigrantes e também encorajar estudantes internacionais a selecionar cursos de alta qualidade que proporcionarão bons resultados de emprego e residência. Essas mudanças tornam os direitos de trabalho pós-estudo da Nova Zelândia muito mais competitivos com países como Austrália (Bacharelado e Mestrado – 2 anos, Mestrado – 3 anos, Doutorado – 4 anos) e Canadá – de 8 meses a 3 anos no máximo.